Physical Features: Upper Coastal Plains; mostly sandy soils, some heavier; San Antonio River, Cibolo Creek. Economy: Agribusiness, oil and gas, commuters to San Antonio; part of San Antonio metropolitan area. History: Coahuiltecan Indians in area when Spanish began ranching around 1750. Anglo-American settlers arrived in the 1840s. Germans, Polish settled in the 1850s. County created from Bexar, Karnes counties and organized in 1860; named for James C. Wilson, a member of the Mier Expedition. Race/Ethnicity: (In percent) Anglo, 57.2; Black, 1.7; Hispanic, 39.8; Asian, 0.5; Other, 1.1; Two or more races, 1.4. Vital Statistics, annual: Births, 562; deaths, 410; marriages, 244; divorces, 118. Recreation: Rancho de las Cabras mission ranch ruins, historic homes; Stockdale watermelon jubilee in June; Floresville peanut festival in October. Agriculture: Cattle, corn, sorghum, hay, cotton. Market value $102.1 million. FLORESVILLE (7,653) county seat; government/services, distribution, retail trade; hospital; parks. 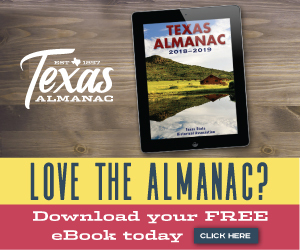 Other towns include: La Vernia (1,374); Pandora (110); Poth (2,223) agriculture, commuting to San Antonio; bicycle ride in September; Stockdale (1,656) agriculture, commuting to San Antonio, museum, nature center, watermelon jubilee in June; Sutherland Springs (420). Part of Nixon (2,505, mostly in Gonzales County). Wildflowers near Calaveras. Photo by Robert Plocheck.